You jump down from the roof of a shed and land in an alley, finding yourself right in the sights of an opponent who is stationed at the other end of the road. He's got the drop on you as well as a better weapon so your only option is to run. In most fps games, your only option would be to run, zig zagging while you do in an effort to throw off your opponent's aim. In Titanfall, you could try the same thing....or you could run at the closest wall, run alongside it, double jump across the alley and run alongside the parallel wall, then double jump again and grab onto the roof, pulling yourself up and over to safety. If any of you are familiar with the mobility granted the player in the modern Ninja Gaiden games (my favourite franchise, as some of you will know) you can get a sense of how it feels to play Titanfall. That sort of agility and freedom of movement completely changes the game and opens up a ton of options both offensively and defensively. It's also simply FUN. 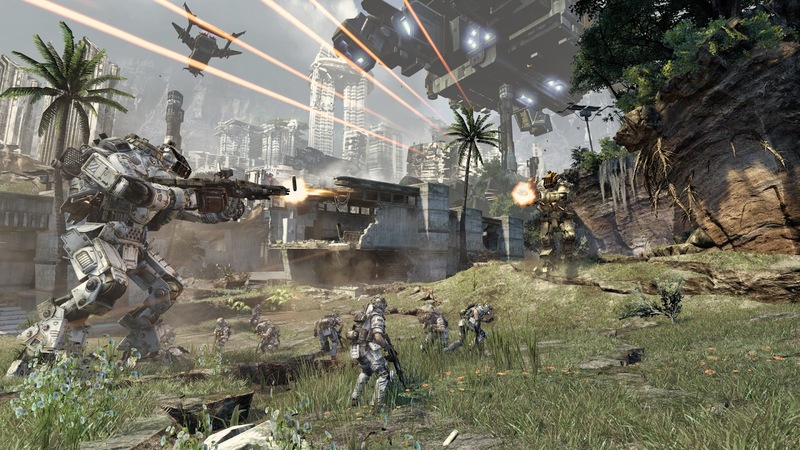 Titanfall’s six-on-six action takes place across 15 large maps, each of which are meticulously deigned, allowing for the Pilots to be able to both seek shelter from the powerful Titans as well as launch attacks from aerial vantage points. 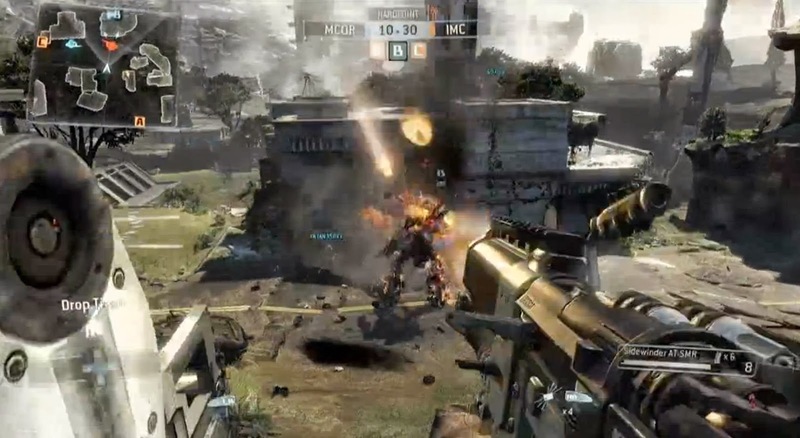 Due to the nature of a mech vs human type of game, the developers at Respawn knew that if they wanted a game with longevity it must be balanced and as such, the part of the game that focuses on playing as the Pilots must confer advantages not related to heavy firepower and high levels of health/armour. Their laser like focus on this aspect of the game in combination with genre experience and a high level of talent provided them with a responsive and fun on-foot portion of the game that perfectly fits with the high firepower, bombastic in mech portion. The Pilots really are on equal ground with the Titans and it is this that makes the game truly a treat to play. Getting a high vantage point does more than provide cover and a safer place from which to shoot. It puts you in a position from which a Pilot can jump onto the backs of enemy Titans, rip out an armoured panel, and blast away at their now exposed and oh so tantalizingly vulnerable circuitry. You can also ride friendly Titans, adding to their firepower. All of this aerial play really lends itself to the game feeling fresh and exciting, as well as more dangerous. Death can come from anywhere in Titanfall and since roughly 80% of your game time will take place outside of the giant and powerful Titans, you better get used to looking up as well as straight ahead and behind you. Luckily for you, and not so luckily for the Titans, you are anything but a sitting duck when on foot. 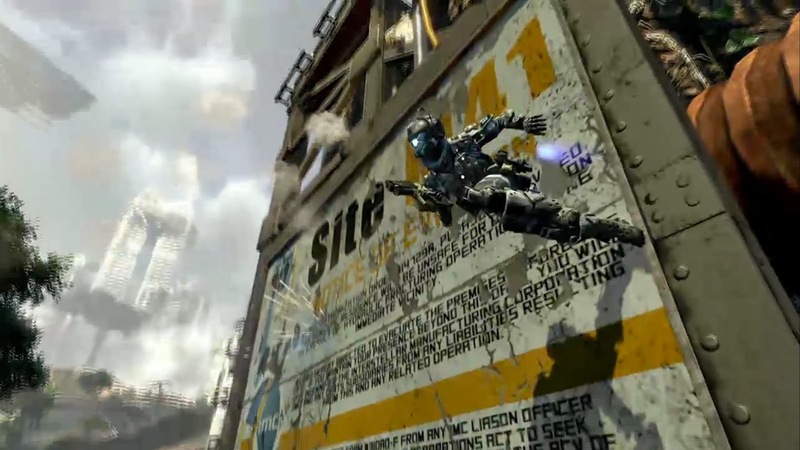 Hell, the vertical, high flying nature of the gameplay almost renders the term "on foot" obsolete and being on foot in Titanfall quite often means flying through the air and along walls rather than running straight ahead and zig zagging and perhaps throwing in the occasional jump or crouch when bullets start flying your way. And so we come to the remaining 20% or so of the gameplay: piloting a Titan. There is a timer that constantly counts down while you are playing without the aid of a Titan and when that timer reaches zero you can summon your own personal hell summoning machine. Titans have three weapons classes. In addition to the primary and side arms classes there is a class dedicated to anti-Titan weapons. These are heavy fire class weaponry, such as mag launchers and rockets. In addition to using the Titan's long list of weapons you can, if the situation calls for it, punch other Titans. A successful melee kill will sometimes reult in a cool animation of you tearing off the other Titan's arms or yanking out its Pilot and chucking them to their doom. In addition to being able to pilot the Titan, each Titan has an autopilot mode which will engage after a period of inactivity, regardless of whether you are in The Titan or outside of it. Once autopilot is engaged the Titan will seek out enemies and attempt to destroy them, not stopping until it is eventually destroyed. Destruction of your Titan results in the re-initiation of the two minute Titan "build" timer. Once it counts down to zero you will have a new Titan at your disposal. Adding to the chaos on screen are the so called Burn Cards. Three of these cards can be utilized in a match, each one granting the player a different ability, weapon or advantageous changes to the map. They are Titanfall's version of Call of Duty's Perks system. 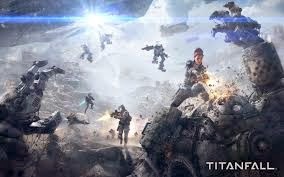 As mentioned previously, Titanfall is an online only game, so fans of offline campaign modes be forewarned: The only "campaign" to speak of is an online multiplayer affair broken up by cutscenes and dialogue. This game was designed with multiplayer in mind and it is in the multiplayer that it really shines. It is six versus six, as I mentioned earlier, but that does not include the Titans, so there are actually twelve combatants on each team, although they are not always present in the fray at the same time, due to the aforementioned Titan build timer. The only real downside to the game's multiplayer is the fact that there are only five multiplayer modes: Hardpoint (king of the hill), last man standing, variety mode (round robin tournament style mix of modes), pilot hunter (team deathmatch) and capture the flag. It seems fairly obvious that there is room for growth in this area; what remains to be seen is whether this will happen in the inevitable sequel, or in the interim between the two games. At any rate, Titanfall is an explosive, agile and fun game. If you like first person shooters, this game is a must.